Date: Tuesday 12th June 2018. Venue: Oxford City & County Bowls Club. Attendees: Colin Barson (CB), Matt Cavill (MC), Maurice Earp (ME), Wes Harrison (WH), Simon Hathaway (SH), Trevor Lambert (TL), Paul Peros (PP), Dave Thornton (DT), Ali Wolfe (AW). Apologies: Jemma Hayward (JH), Michael North (MN). 1 – Minutes of last meeting (9 May 2018). 2 – Actions arising from the minutes. Member number 1000 had been given a life membership and his comments on joining OxVox had been posted to the Trust website. TL would contact Oxford City Council to ascertain progress with the Community Right to Bid renewal. Stewart Donald, now chairman of Sunderland, would not be continuing his role as co-optee to the committee: this was recently notified to members. CB had spoken to Stewart who is happy with the decision and fully understands the reasons for it. TL reported that he had received all relevant bank account details and records from Terry Winter and he now had access to the Trust PayPal account which is principally used to receive online membership payments. Outstanding tasks were a) to review cheque signatories and contact details for the Trust’s main account b) to upload recent Trust accounts to the Financial Conduct Authority c) to pay the Supporters Direct affiliation fee of £60. GDPR: The Trust holds contact and membership details for members in order to enable sustained contact with members on matters relevant to the aims of the Trust. Supporters joining the Trust normally give consent to be contacted by email, but they have the option to be excluded from emails, both on joining and on each email sent via an ‘unsubscribe’ option. This consent means that we have no requirement to contact members individually to ‘sign up’ to continued contact, reported TL. Members wishing to confirm that the information held by the Trust about their membership is accurate may email enquiries@oxvox.org.uk to receive details. The membership total at 10 June 2018 was 1005. ME had mailed AGM information to approximately 30 members with no email or ‘bouncing’ email, inviting them to supply a working email if they had one. ME and TL were looking at renewals due later this year, which numbered approximately 150. The committee discussed membership fees, renewals and categories of member. It was agreed that we would continue to actively encourage renewing ‘3 year’ members to convert to life membership, and offer attractive rates to do so. We agreed also to look at ways of encouraging a larger number of younger fans to join, and to consider the role of junior membership and the minimum age for full membership. 5 – Committee responsibilities and working parties. Yellow Army & Ultras links: SH, AW. Stadium: CB, PP, WH. This was a priority area and the subcommittee would maintain close contact with all stakeholders in discussions surrounding the stadium and stadium developments. Social media: AW, DT, SH. AW will lead on running the OxVox Twitter account and the official OxVox account on Yellows Forum. 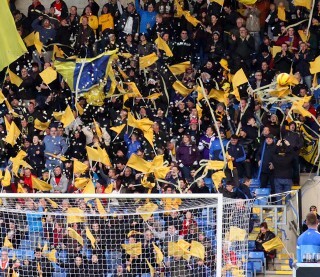 SH will work on broader fan engagement together with the Yellow Army: in the short term this will include disseminating information to fans going to Ireland for the pre-season matches. It was agreed that, for future committee meetings, members would be notified by email in advance and invited to forward any questions for the Trust. The committee agreed to brainstorm ideas for member benefits, to encourage new members and to offer greater value to members. We would also look at the potential for commercial partners for the Trust. A ‘matchday presence’ at selected matches was being considered. 7 – East Stand mural. Plans are progressing: photos to make up the mural are being selected and where necessary copyright permissions are being sought, reported SH and AW. Physical design, costings and funding are in the process of being finalised. The Trust was in continual dialogue with club safety officer Ian Mixter regarding the club’s OxRails project, reported AW. We were also aware of the parliamentary debate on 25 June on safe standing. JH had drawn our attention to the press releases supporting safe standing by Layla Moran MP (Oxford West & Abingdon) and was in touch with her. TL had contacted Anneliese Dodds MP (Oxford East) and she had also expressed her support for safe standing in principle and the OxRails project. The Trust was formulating questions for the debate, which would be passed to the MPs in the next few days. It is possible that further developments on OxRails may be put on hold pending the outcome of the June 25 debate. 9 – AOB and close. The Trust is assisting the Community Trust and the football club with a project to create a sensory room, about which more details will be available in due course. The meeting ended at 10.10pm. All present thanked the Bowls Club for their hospitality.